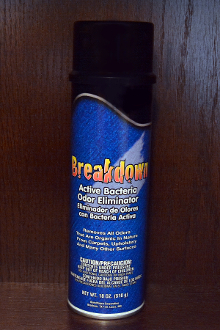 BREAKDOWN is an active bacteria specially designed for easy application on carpets and upholstery to eliminate odors that are organic in nature. Can be used on most surfaces. Great product to get the odors out of the Vehicles using a spring mist scent and without "masking" them. Effectively counteracts pet and body odors left behind on carpets and in fabric. It can also be used in kennels, bathrooms, trash receptacles and kitchen areas. The unique inverted valve provides easy application. This product works great in kennels, veterinary clinics, kitchens, bathrooms, hotels/motels, restaurants, trash receptacles, schools and daycares. An excellent product for carpet and upholstery cleaning contractors and car detailers. It can also be used as a laundry pre-spotter to remove organically based odors.